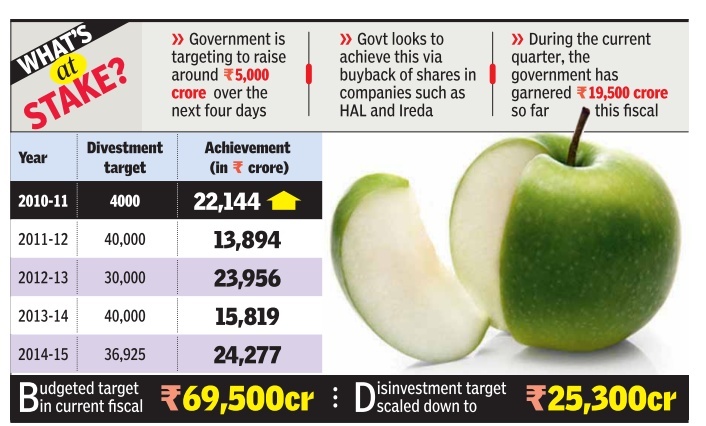 The government is targeting to raise around Rs 5,000 crore over the next four days as unlisted public sector companies with Hindustan Aeronautics Limited (HAL) and Ireda agreeing to buy back the Centre's shares by dipping into the surplus cash at their disposal. The last-week rush is meant to help the government meet its revised disinvestment target of Rs 25,300 crore. With two stake sales -Concor and Engineers India Ltd -during the current quarter, the government has garnered Rs 19,500 crore so far this fiscal. “There are no more public issues this year,“ said a finance ministry official. The government had budgeted for record disinvestment of Rs 69,500 crore during the current financial year but had to lower its ambitious target in the wake of poor market conditions and its inability to push through strategic sale. But even that target is looking tough, prompting the government to rush ahead with other options to raise resources, including buyback and special dividend. As a result, last week, HAL board cleared the buyback plan, while Ireda has been asked to opt for the same route or pay special dividend.“Since buyback of shares in listed entities will take longer the government is looking at unlisted companies to help it meet the target this year,“ said an official. Listed companies with surplus cash and few capital expenditure plans lined up, will follow during the next financial year.